Researchers have developed a method to change the shape of a flat sheet of elastomer, using actuation that is fast, reversible, controllable by an applied voltage, and reconfigurable to different shapes. Nature has developed far more sophisticated forms of movement -- or actuation -- that can perform complex functions more directly and with soft components. For example, our eyes can change focal point by simply contracting soft muscles to change the shape of the cornea. In contrast, cameras focus by moving solid lenses along a line, either manually or by an autofocus. 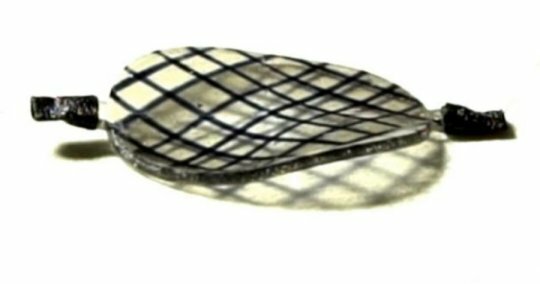 "We see this work as the first step in the development of a soft, shape shifting material that changes shape according to electrical control signals from a computer," said David Clarke, the Extended Tarr Family Professor of Materials at SEAS and senior author of the paper. "This is akin to the very first steps taken in the 1950's to create integrated circuits from silicon, replacing circuits made of discrete, individual components. Just as those integrated circuits were primitive compared to the capabilities of today's electronics, our devices have a simple but integrated three-dimensional architecture of electrical conductors and dielectrics, and demonstrate the elements of programmable reconfiguration, to create large and reversible shape changes." "In addition to being reconfigurable and reversible, these shape-morphing actuations have a power density similar to that of natural muscles," said Ehsan Hajiesmaili, first author of the paper and graduate student at SEAS. "This functionality could transform the way that mechanical devices work. There are examples of current devices that could make use of more sophisticated deformations to function more efficiently, such as optical mirrors and lenses. More importantly, this actuation method opens the door to novel devices that deemed too complicated to pursue due to the complex deformations required, such as a shape-morphing airfoil." Materials provided by Harvard John A. Paulson School of Engineering and Applied Sciences. Note: Content may be edited for style and length.